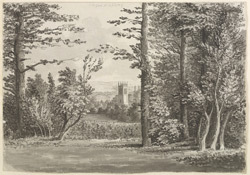 A view in ink of Magdalen College Tower in Oxford, taken from the Grove, drawn by S.H. Grimm. The Founder's Tower of Magdalen College, Oxford was originally the main entrance. The college was founded in 1458 but work on the buildings did not begin until 1472. The tower is named after founder Bishop Waynflete, and connects St John's quad with the cloister.